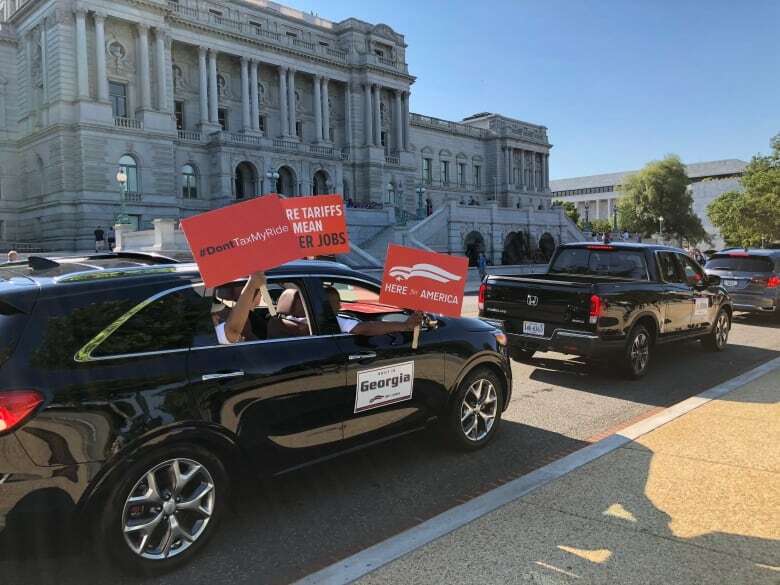 The world's automotive industry gathered in Washington with uncharacteristic unity, to deliver a singular message to American policymakers: If you start a trade war with tariffs on cars, you'll shoot yourself in the foot. The issue that has been gaining steam for weeks came to a head Thursday as dozens of representatives from the industry around the world deliver their remarks at a hearing before the U.S. Commerce Department, which is mulling putting tariffs of up to 25 per cent on all vehicles imported into the U.S., including from Canada. Some of the loudest voices came from the American auto industry — the companies and workers that the levies are ostensibly trying to protect. "Broad restrictions such as tariffs on autos and auto parts will raise cost for our customers and their families," said Stuart Countess, president of Korean car-maker Kia's American arm. "That's why we echo the plea, don't tax my ride," he said, to raucous cheers from those watching. "I am mystified by the argument that imported cars and imported car parts are a threat to national security," said John Bozzella, president and CEO of the Association of Global Automakers. "In fact, it's just the opposite." Far from being a threat to the U.S. economy, Bozzella said the globally diversified supply chain in the automotive sector is a boon for both car companies in the U.S. and consumers. "There is not been a single company that I know of that has requested protection in the form of tariffs," he said. "I've been in this industry for over 20 years and have never seen this unity in this combined purpose to push back against these tariffs." That's because American companies and consumers would bear the brunt of the punishment if the tariffs come to pass. 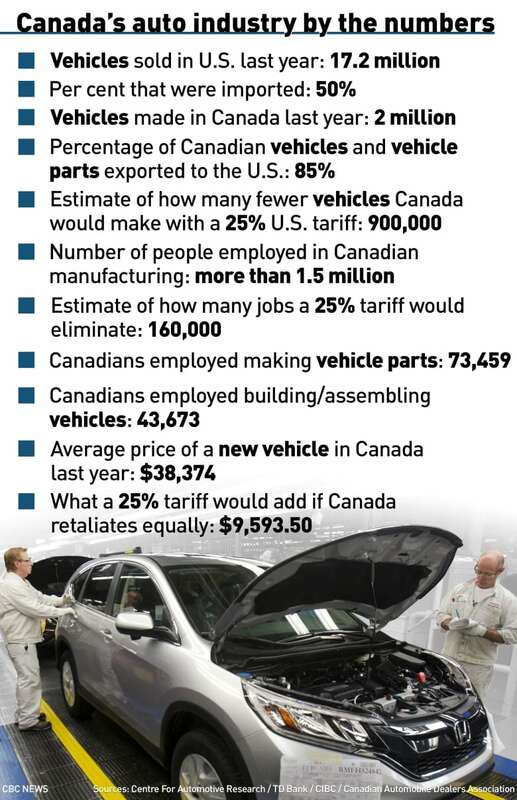 The non-partisan think-tank the Centre for Automotive Research (CAR) put out a report this week outlining its projections for what tariffs would do, and the numbers paint a bleak picture. If the administration makes good on its threat, it will reduce U.S. car demand by up to two million vehicles a year. More than 750,000 jobs would be lost and consumers can expect to pay an extra $ 4,400, on average, for a new car — regardless of where the vehicles are built. Those dire projections don't even include the damage that would come if interests in the rest of the world retaliates with tariffs of their own, something Canada's representatives made clear would happen. "Should this investigation ultimately result in the application of tariffs on autos, Canada will once again be forced to respond in a proportional manner," Kirsten Hillman, Canada's deputy ambassador to the U.S., told lawmakers. Canadian auto-parts maker Martinrea is based in Vaughan, Ont., but the company has facilities on both sides of the border and ships parts between its different locations constantly. That is why the company's chief financial officer says tariffs will not only be devastating, but also next to impossible to implement. "The industry is so intertwined at this point in time," Fred Di Tosto said. "If you impose these tariffs it will have huge implications, we believe. Not just here in Canada, but in the U.S. and Mexico as well." There has been a suggestion that globally diversified manufacturers like Martinrea might try to adjust their supply chains to get around tariffs — to supply their U.S. customers from U.S. plants, and Canadian ones from Canada, for example — but Di Tosto says that idea isn't feasible. That's a "ridiculous proposition," he said. "The cost to do something like that would be enormous and would not make any sense." The president of Canada's automotive parts manufacturing association is even more blunt in his assessment. "This is madness," Flavio Volpe said in an interview. "To charge American consumers a tax on goods they consume from Canada is akin to shooting yourself in the foot." It remains to be seen whether the administration will even fire this particular bullet as its global trade war unfolds. The Commerce Department opened its investigation in May, and by law it has nine months to come to a conclusion and make a recommendation to the White House. That puts the deadline to February, at which point the president would have 90 days to respond. But given how swiftly things are moving on the trade file, first with steel and aluminum, and then uranium, the final decision could come much sooner than that.